We’re looking to expand our founding team. Are you the person we’re looking for? Read about our vision and the roles available, and apply! We’re looking for our founding team. Tribeless started off as a series of “stranger dinners” in Kuala Lumpur. Today, we’re so much more than that. 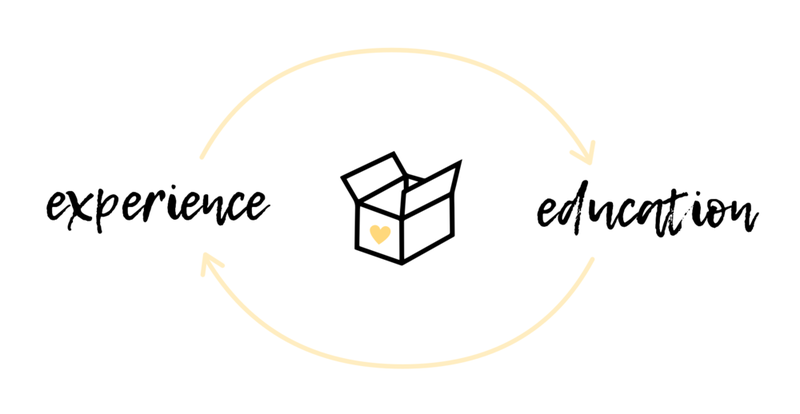 For the past two years, we’ve been hard at work experimenting, testing and refining our methodology, in hopes of answering the question: How can we create a world where empathy is the foundation of all our interactions? The world needs what we do. And we can’t do it alone. We want to be honest with you – we’re a young company, and resources are tight. You probably won’t be making as much as you would… anywhere else. You’ll have to figure a lot out for yourself. There will be a lot of fights, a lot of pain, and a lot of uncertainty. But you will grow – oh, will you grow. You will learn so much about yourself – your quirks, your weaknesses, the things holding you back from stepping into your full potential. We’ll hold each other accountable. We’ll have the BEST inside jokes. We’ll learn to listen, empathize, and speak our truths — because we’re no experts at it, either, and the journey is long and hard. If this resonates with you, we’d love to invite you to join the team. Application forms will be assessed on a rolling basis. You can expect to hear back from us within the week, if not sooner! We’re all the same on the inside. It’s a revolutionary thought. One that can change so much about our world. For that to truly stick, though, we need to be experience it for ourselves. After selling 120 Empathy Boxes, and compiling the feedback, we realized we were missing that crucial component. For the education of empathy to be truly effective, we need to make it experiential and in-person. “Empathy Box 101”: Half-Day Empathy Workshops. These will be a fun, effective introduction for people to start practicing empathy in their everyday conversations. Comes with a Basic Empathy Box. “Empathy Box Advanced Facilitation”: 2-Day Empathy Box Training. 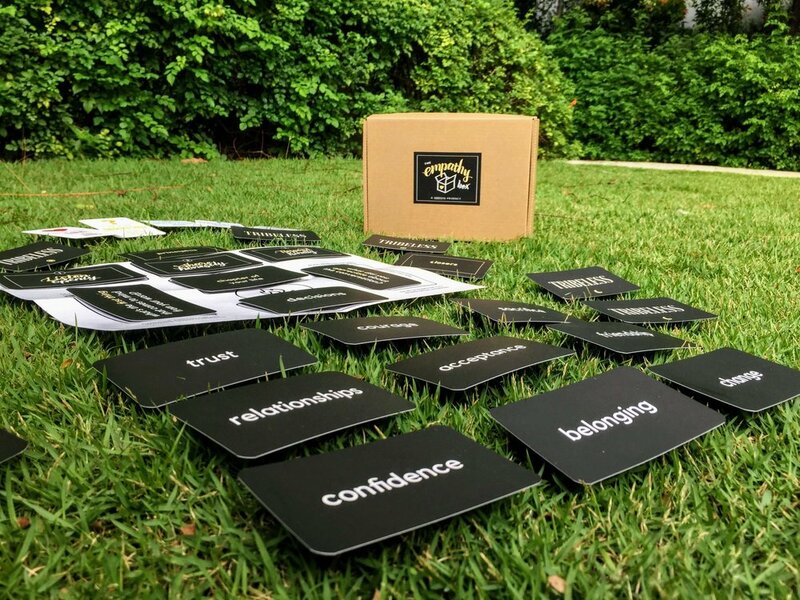 Designed for trainers, facilitators, or anyone who wants to bring the Empathy Box into their work, these will focus more on the technical skills of using the Box. Comes with an Advanced Empathy Box. Custom Tribeless Sessions for conferences and companies. So far, we’ve worked with medical professionals, insurance agents, even a TEDx in Singapore. We’re so excited to see what else comes our way! These are the three roles we’re currently looking for, but as a part of the founding team, you can expect to do a little bit of everything. As a general rule of thumb, you’d enjoy  people,  details, and  feedback. 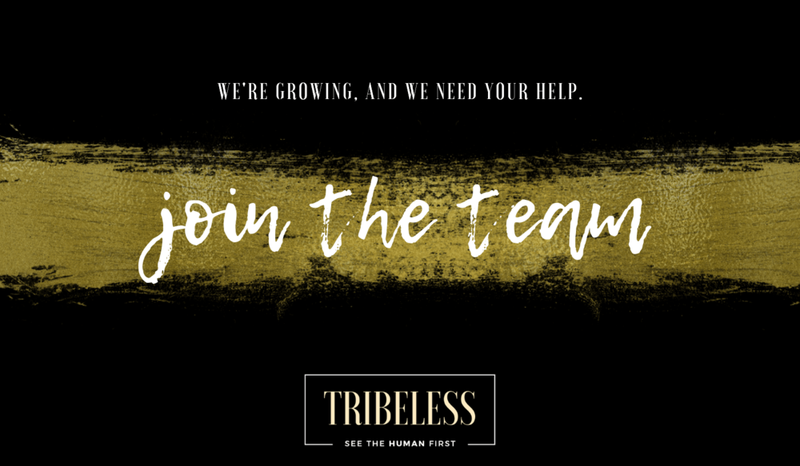 At Tribeless, we #SeeTheHumanFirst, and so we legit don’t care about your degree or CV. (Heck, the two of us are drop-outs ourselves!) Please don’t let your background or limiting beliefs hold you back from applying. We’re really excited to get to know you, regardless! The application process itself will shed a lot of light on who we are as a company, so if it’s not your cup of tea, that’s probably a good enough sign that we’re currently not a good fit for each other – and that’s totally cool. WHO YOU ARE: A strategic and determined person. Thoughtful and imaginative. You will spend most of your time conceptualizing, executing and managing digital marketing campaigns to completion. Experience with FB/IG/LI marketing and SEO a plus. Develop and manage digital marketing campaigns to generate public awareness about Tribeless. Track metrics and data from the campaigns, and translate them into actionable insights. Conceptualize and produce content that establishes our thought leadership (articles, whitepapers, videos, etc). WHO YOU ARE: A people person that thrives on meaningful and frequent interaction with others. Enthusiastic and proactive. This role is a mix between talking to people on 1-on-1 calls, organizing group meet-ups, and catalyzing connections within the community. Conduct design research calls to get to know our Empathy Box users better. Manage all our social media inboxes and general inquiries. Create internal newsletters to keep our community updated. Organize community events and meets (online & offline). Keep a regular pulse on the needs of the community. WHO YOU ARE: An open and curious person. Attentive and flexible. You champion and support people who want to bring Tribeless into their events or organization. Most of your time will be spent on understanding their needs and packaging our products for them. Meet with existing warm leads to understand where Tribeless fits into their bigger picture. Create corporate and client packages and proposals with appropriate metrics and data. Work closely with Marketing to create a clear leads funnel. Nurture relationships with past clients and new leads. *This is a commission-based role.